Product prices and availability are accurate as of 2019-04-18 06:08:39 UTC and are subject to change. Any price and availability information displayed on http://www.amazon.com/ at the time of purchase will apply to the purchase of this product. 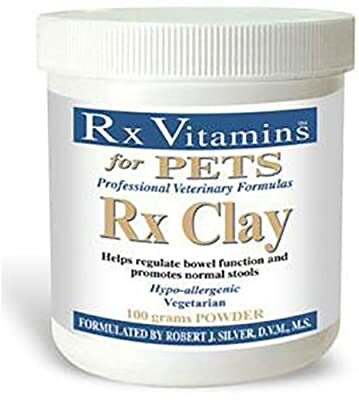 The Rx Vitamins for Pets RX Clay for Dogs & Cats is recommended by Dr. Susan Ettinger (co-author of the Dog Cancer Survival Guide) for dogs with chronic diarrhea, or to maintain gut health for dog's with GI cancer. As always, please consult with your vet to ensure that this product can work alongside your dog's current treatment plan! If you’re looking for a supplement that might work to keep your pet’s gastrointestinal tract healthy‚ Rx Clay Powder by Rx Vitamins for Pets may be right for you and your furry friend. Specifically‚ Rx Clay Powder contains hydrated calcium alum inosilicate‚ which is a natural substance that may be able to adhere to bacterial enterotoxins to help remove them from the GI tract. As a result‚ this product may help address certain symptoms related to mild diarrhea‚ such as loose stools. Since this Rx Vitamins for Pets supplement might work to restore the intestinal mucosal barrier‚ it may also play a role in relieving minor inflammation or vomiting associated with leaky gut syndrome. Last‚ Rx Clay Powder is vegetarian as well as hypoallergenic. Each bottle of Rx Vitamins for Pets’ Rx Clay Powder contains 100 grams of powder. Give your pet one scoop for every 10 pounds of body weight twice daily.